Stuttgart's upcoming hybrid will be available as a stripped-out hard-core supercar. There are few things we love quite as much as top-of-the-line supercars from storied European exotic automakers. After all, what could be better? How about a stripped-down, track-focused version of one of those very supercars? It&apos;s a formula that Ferrari has followed with the 430 Scuderia, Lamborghini with the Gallardo Superleggera and Porsche with the 911 GT3 RS, to name just a few. Now Porsche is preparing to do the same with the upcoming 918 Spyder. 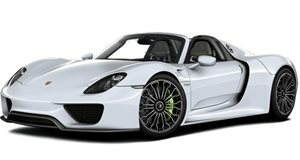 In case you&apos;re not familiar, the 918 Spyder is a new supercar coming from Stuttgart that will take the place once occupied by the Carrera GT and 959. But the latest Porsche supercar combines a 4.6-liter V8 with a pair of electric motors to deliver 762 horsepower. With a weight capped at 1,700 kg, it&apos;s sure to be a veritable hybrid rocket ship. New reports indicate, however, that Porsche is planning to offer an even more hard-core, lighter-weight version for track-day enthusiasts. The stripped 918 will be available with no paint, a bare-bones interior and, we&apos;d expect, an even tauter suspension. There are no indications of a power increase, but when 762 ponies and 552 lb-ft of torque are involved, underburned no less by 30 kg less weight, who needs any more? Sources expect about 20 percent of the 918 examples of the 918 Spyder (pictured here as a prototype in black and white and as a show car in silver) to be sold with said Race Track package after the model goes on sale a little over a year from now.